Happy Tuesday to you! 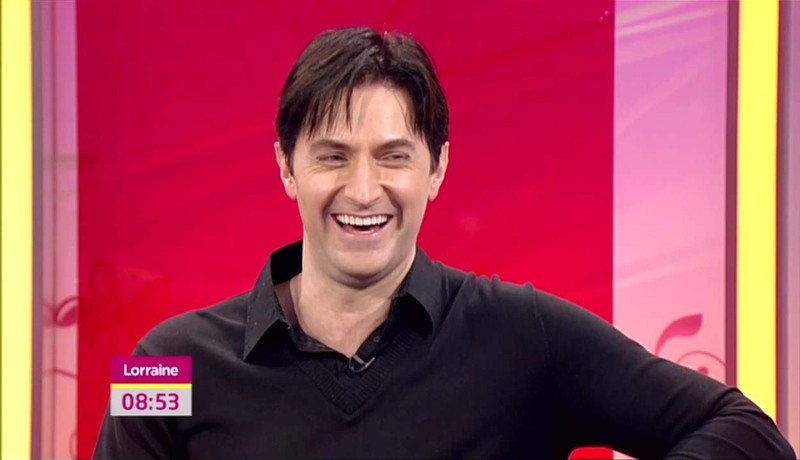 Today’s image is a picture of Richard Armitage laughing on the Lorraine Show contributed by Beachbaby. She also recommended “Your smiling face” sung by James Taylor. Thank you, Beachbaby! I used the Elliptical Marquee Tool with a 1 pixel feather to cut out the first image and used that as a “cookie cutter” for the remaining images. I overlapped the ovals and added a drop shadow for depth. For the text “Richard Armitage,” I used the Mom’s Typewriter font and used the Create Warped Text button in Photoshop to give it a wavy effect. I lowered the opacity of the stars and placed it over a solid black layer. Finally, I created two hearts using the Custom Shape tool. I gave the hearts an outer glow and changed the Fill to 0% so the hearts would disappear but the outlines would remain. Which is your favorite Richard Armitage interview? I’ll tell you my fave tomorrow! This entry was posted in Collaborative Project, Graphics, richard armitage and tagged actor, james taylor, richard armitage, richardarmitagenet, richardarmitagenet.com, richardarmitagenetdotcom, smile, whenever i see your smiling face, your smiling face. Bookmark the permalink. Hi bccmee, Beachbaby’s choice of screencap really inspired you to create a delightful mini-masterpiece! I really like your treatment of this sequence of shots. Who can resist a smiling RA? I like the music choice as well, James Taylor is a favorite of mine. I love to see RA laugh! The image choices and the resulting siggie are amazing! Thanks for this lovely Tuesday gift! Thank you, bccmee and Beachbaby! Great choice of pic and music Beachbaby. What’s better than one Richard? Four of course!! I really, really, really, needed a smile today Bccmee and Beachbaby, and I especially love that man’s smile. Thank you. Favorite interview, I have so many. One of my favorite TV interviews was from 2007 during filming of Robin Hood, one of those morning programs, BBC Breakfast. *smiling, purring* What a lovely graphic you created. Looking at it, I can’t help but smile myself. Beautiful graphic! 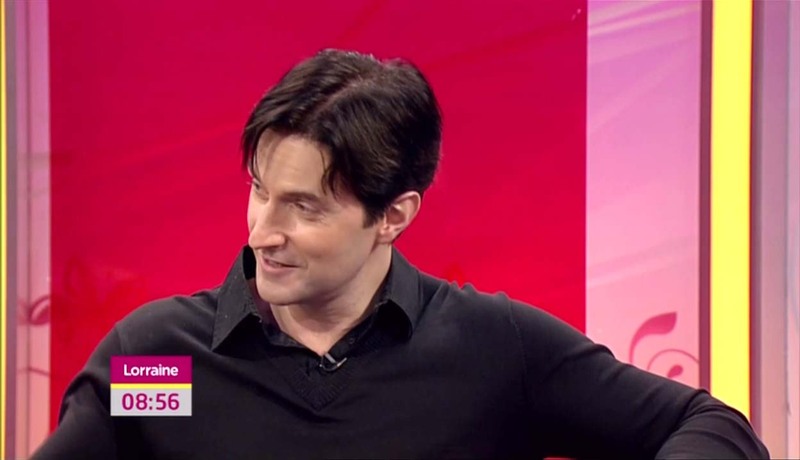 I love all Richard’s interviews, but I especially prefer Richard Armitage BBC America interview Jul 10 2008. I love to see him smiling and laughing! Thank you! And thank you, Bcc, for the opportunity to meet so many songs! “I lowered the opacity of the stars” … goodness, bccmee, you ARE talented! Perhaps you can fix global warming? Team Day 15 has defined “feel good” in a hot pink, starry, Richardy way. Like mariana, my favourite interview is the BBC America one – his reaction to the question about him always wearing black is just the best. Wow, I love it Bccmee. 🙂 When I posted the laughing pic I thought that it would be nice to have other smiling pics with it – and there they are! I love how Richard on the end is looking at the others smiling & laughing! My selection was inspired by your Valentine’s Day vid, I have it on my ipod and watch it lots as it always makes me smile. Favourite interview? I adore the Spooks 7 promo interviews from Oct 2008 on BBC Breakfast & ITV’s This Morning. He was in the middle of filming RH3 & his long hair is pulled back. He looks so shy & cute. The siggie is really sweet! I love how you expanded the different head shots. Each day, I think, she can’t top this and every new day you do.Thanks bccmee and Beachbaby. Richard’s lovely smiles and the upbeat music!! Just what I needed to lift my spirits today and it worked wonders!!! 😀 Thank you ladies. The siggie is wonderful BTW! Can you make it into a wallpaper by any chance Bcc??? Pretty please!!!!!!!!!!!!!!! This siggie made me smile the moment I saw it. Four Richards are better than one. He has a gorgeous smile. Favorite interview? There was one I saw with Lorraine(at least I think that’s who it is) where she starts talking really fast and Richard has to talk fast just to keep up with her. Love the way you manage to add to it bccmee. He looks really animated as a result. 🙂 Well done! He has such a lovely smile. It helps him to look great at his age. Isn’t it nice that he’s not one of those people who don’t like to smile or laugh that much? Lovely siggie,bcc. Great pic choice Beachbaby.I love to see Richard smiling or laughing!He seems so at ease when he does this. HAPPY HAPPY JOY JOY – that is what I feel when I see this siggie! I brought me a big smile to my face and a happy gooey fan-gurl gushy feeling inside! I enjoy so many of his interviews but I love the [spooks] behind the scenes stuff/interview he did for series 7. Also, I LOVE his interview behind the scenes of VoD!